The Current Health Scenario. : How "Polio" became an "epidemic"
San Angelo bought two fogging machines to bathe the city in DDT. Twice each day, flatbed trucks would rumble through the streets, spraying the chemical from large hoses while children danced innocently in the mist that trailed behind. As a goodwill gesture, the local Sherwin-Williams store provided DDT at no cost, urging customers to drench the walls and furniture in their homes…..
By mind-June more than half of San Angelo’s 160 hospital beds were filled by polio patients, almost all of them children under 15. In truth, polio was never the raging epidemic portrayed in the media, not even at its height in the 1940s and 1950s. Ten times as many children would died in accidents in those years, and three times as many would die of cancer. Polio’s special status was due, in large part, to the efforts of the National Foundation for Infantile Paralysis, better known as theMarch of Dimes, which employed the latest techniques in advertising, fund raising and motivational research to turn a horrific but relatively uncommon disease in to the most feared affliction of its time. No infection has ever drawn as much attention or struck as much terror in the hearts of parents as polio. Yes, some people died and some people were left with lame limbs. But the marketing behind the drive for the first nationwide vaccine campaign has left memories that have lingered for two generations, and long after the Western Hemisphere was declared polio-free by the WHO in 1994. When I ask people, “What pops into your mind when I say the word ‘polio'”? The answers are always the same: Wheelchairs. Crutches. Kids with leg braces. Paralyzed limbs. Iron lung machines. And was a virus really the cause of paralysis? Or did the DDT cause the neurological disturbances, which were then conveniently blamed on a usually mild viral infection, seen mostly in summer, and primarily in children? Polio is an enterovirus. More than 90% of people who were exposed to the virus experience something that looked like a mild case of food poisoning: cramping, diarrhea, mild fever, perhaps vomiting. The infection passed through, leaving a lifetime of true immunity behind. About 3% of people experienced what was called non-paralytic polio, which was often diagnosed as viral meningitis. Symptoms included high fever, a severe headache, a stiff neck and often asymmetrical limb weakness. The illness lasted about 10 days, followed by complete recovery and true, lifetime immunity. Less than 2% of those who contracted the infection experienced severe paralysis, and only 2% of that 2% – or 0.04% of all cases of diagnosed polio – contracted bulbar polio, the type of infection that affected the ability to breathe. And of those who had numbness, weakness or mild paralysis of a limb, 50% fully recovered within two years. Rotary International and the Gates Foundation have partnered with the CDC, UNICEF and WHO to develop the Polio Eradication and Endgame Strategic Plan for 2013 to 2018. The estimated cost for this initiative is $5.5 billion, on top of the billions spent since 1979, when Rotary International first got involved in the business of polio. This 134-page document details the plan to eliminate a virus from the planet that is associated with more hype than harm. In 1988, there were 350,000 cases of paralysis attributed to polio, still not that many in relation to total global population. Most recently (2015), the WHO reported only 74 reported cases of confirmed paralytic polio in the entire world. There are more than 7.5 billion people on this planet. All this hysteria, all this surveillance, all this money…over 74 people. And we don’t know if the paralysis was permanent – or if the child fully recovered. What’s worse about all of this ambition is that polio is NOT a synonym for paralysis. Some day, after spending billions and billions and billions of dollars to remove three strains of Enteroviruses from the planet, the globalists will puff up their chests and declare that the world is now “polio free,” thanks to the wonders of polio vaccines. The international polio surveillance system is based on actively looking for cases of acute flaccid paralysis (AFP), defined as an onset of limb weakness that progresses to paralysis in less than four days. The affected limb or limbs are flaccid, meaning, floppy or limp. When AFP occurs in a foreign country, stool and saliva samples are whisked off to regional centers to be tested. If a single poliovirus is found, the alarms go off and there is a mad dash to vaccinate the entire country with another round of oral polio vaccine. If a polio virus is not found, nothing is done. Why? Because other viruses can cause AFP including Coxsackie A, Coxsackie B, Japanese encephalitis, Echoviruses 19 and 33, and other Enteroviruses, including Enterovirus 71 and Enterovirus D68. The slide (below) is a little dated. I created it a few years ago for a presentation in Pennsylvania. It was a lot of work pulling those numbers from various WHO documents that use size 2 font, so I’m using the slide for demonstration purposes, not reporting absolute or current numbers/stats. The WHO divides the world into six sections for polio surveillance. The first column is the number of cases of AFP reported per region. The second column is the number of samples with wild-type poliovirus. You can see that worldwide, the number of cases of paralysis associated with poliovirus is 0.02% of all samples. The third column? 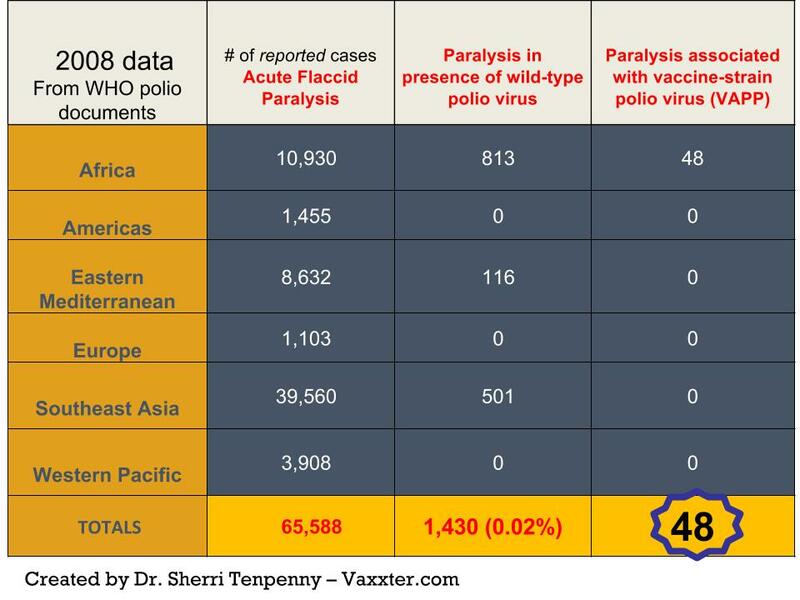 The number of cases of paralysis caused by the oral polio vaccine. Approximately 2 cases of VAPP occur for every million doses of OPV administered. That’s a dirty little secret rarely talked about. VAPP is the reason that the US stopped using the oral polio vaccine in 2000 and transitioned to the injectable polio vaccine (IPV). 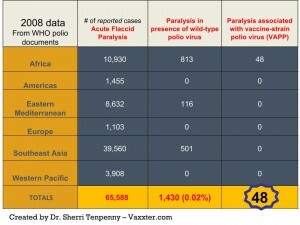 Note that the Americas had 1,455 cases of paralysis even though the Americas were certified to be polio-free since 1994. You can click on the slide to enlarge it. Again: Polio is not a synonym for paralysis. Polio eradication will not eradicate paralysis – but isn’t that the point of the exercise? What if those many billions of dollars had been spent on potable water, adequate food, electricity for refrigeration, adequate food, literacy campaigns, and safe housing? More money, time and lives wasted on vaccines.